Those interested in leading a sustainable lifestyle may wish to generate their own renewable solar energy. Solar energy is the most popular form of do-it-yourself renewable energy and can be used to produce electricity for home or business use. Forms of solar energy include 'solar thermal' energy, which harnesses the suns heat to warm water for domestic and leisure use, 'photovoltaic' energy, which transforms solar energy into electricity and 'passive heat' or 'passive energy', which involves the design of buildings to maximise the suns natural heat naturally. All three of these forms will contribute to a better environment for the home, and wider world. 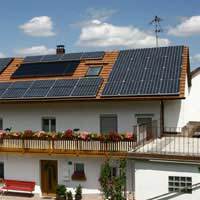 The U.K. solar energy society give a wide range of practical advice on installing solar energy systems at home and obtaining financial help. Energy supply companies are obligated by law to actively encourage homeowners to invest in solar energy under wider UK commitments to reduce carbon emissions. The government backed 'Energy Saving Trust' are committed to helping individuals and businesses save energy and provide information on obtaining financial help from energy companies for developing domestic renewable energy sources. Some private companies will help you get funding for the installation of their solar energy systems. Solar Thermal Energy systems use roof-mounted cells to receive heat directly from the sun and compliment your existing conventional heating system. Various systems are available and what you choose will depend upon your location in relation to the sun. Generally you will need a south-east to south-west facing roof within full view of the sun during the daytime. Given the right conditions a solar thermal energy device can generate up to 60% of your heated water and will generally cost around £4000 to have installed professionally, or around £2000 to make and install yourself. Solar Thermal Energy systems generally consist of either a series of heavily insulated glass cells grouped together. In both cases the device heats up local water pipes through conduction. It is possible to save as much as 40% on your heating bill through the installation of solar thermal energy heating. Solar electricity is produced by photovoltaic cells grouped together in panels to capture the suns natural radiation and convert it into electricity. Photovoltaic cells are comprised of 'semiconductors' that absorb light; the light then causes a reaction amongst 'electrons', which are then directed as electrical currents, turning the cell into a battery, or generator. The average domestic photovoltaic system costs between £4500 and £15000 to install. At the moment photovoltaic systems are not cost effective (costing marginally more, over time, than wind generated energy), but with energy prices from conventional sources rising and the cost of installing solar panels falling, they will become economically viable in the near future. Passive forms of solar energy involve designing our home to maximise the benefit of the suns heat and reduce lighting and heating costs. This will be dependent on the position of your house in relation to the sun. Taking this into account, it is possible to maximise window space, wall area and positioning of these features to take advantage of the suns natural heat, whilst maximising insulation and minimising drafts. Costs can vary hugely and the economic benefits will be relative to the condition of your house before redesign and the cost of renovation - or the cost of a designing and building a new home. Solar energy is a relatively cost effective way of employing sustainable energy within the home. Government subsidies and falling costs make this a viable and rewarding option for anyone concerned about the environment.